Having recently moved to Texas, we are taking full advantage of having an array of fabulous locations to visit within driving distance of San Antonio. Of course, this means we usually want to travel with our two fur babies, Bo the Boston terrier and Matilda the pug. 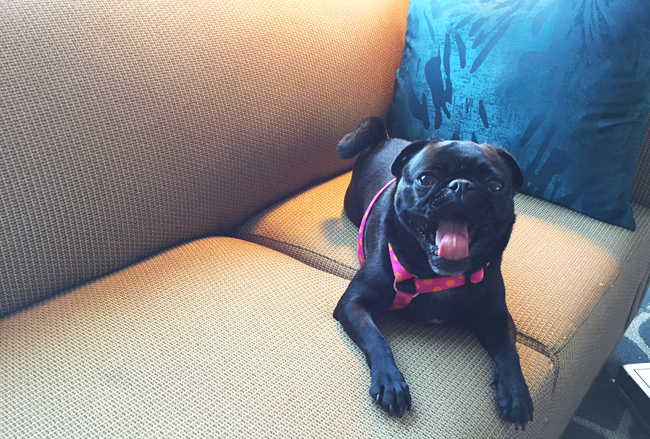 If you’re about to travel with pets, you’re probably wondering how to sort out how “pet friendly” a hotel actually is, and what to expect when you check in. 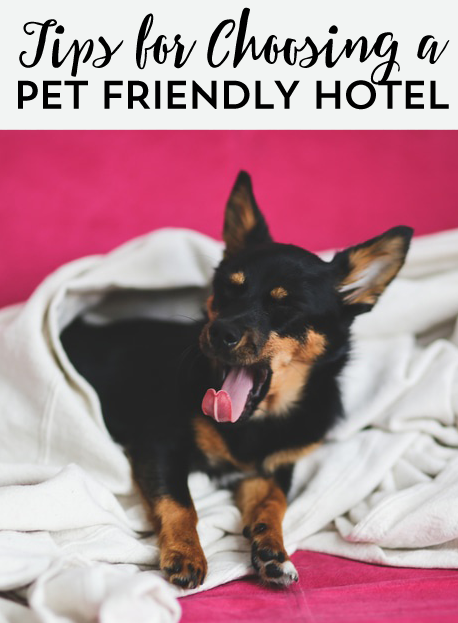 In order to keep your travels as stress free as possible for yourself, your pets and the other hotel guests, here are some tips on how to pick a dog friendly hotel. 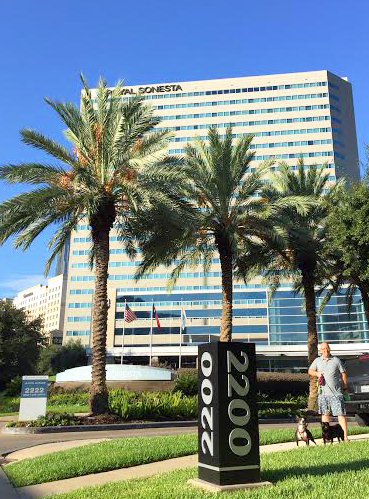 We recently stayed at the fabulous Royal Sonesta Houston in order to test out these tips and fine tune our personal process for pet-friendly travel- they were great hosts and our stay was incident free. First, consider your itinerary for the trip, is this a good fit for Fido to tag along? Before you even pack up the car, be sure you understand both your purpose for the trip, travel time and the extra time your dog may need to adjust to a change in habitat and routine. You know what’s going on, they don’t- and a stressed out, howling pooch when you want to hit the pool can be a bad time for everyone! That being said- when planning your trip, will you have enough time to potty the dogs regularly or will it cramp your style when you’re on vacation? If you’re not sure if you’ll really have time to be with your pets, maybe reconsider bringing them, it may not be a good fit for a jam packed weekend full of activities. Whenever possible, give yourself extra travel time for walking, feeding and general acclimation to a new environment to ensure your dog isn’t stressed out or disruptive. It could mean getting kicked out of a hotel, canceling plans to go out or yes, fees to pay for their nervous chewing. Plan ahead. Additionally, allow for extra time during check-in, you’ll likely need to fill out an agreement form that’s pet-specific just for furry guests. Truly pet friendly hotels will make both you and your pooch comfortable in a quite room so nobody (including other guests) are stressed! 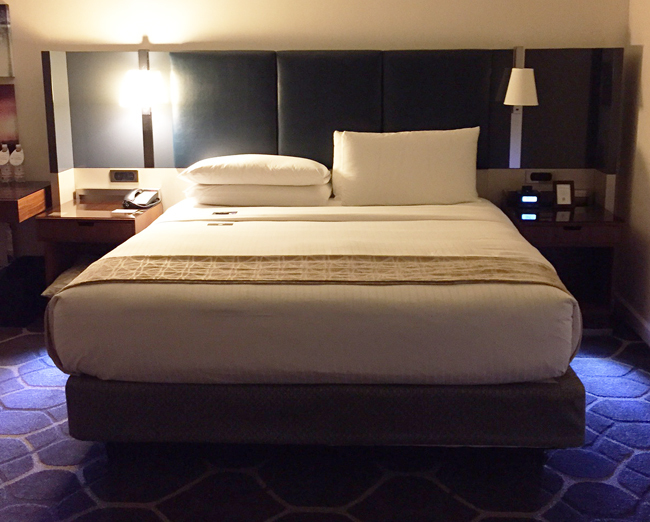 This was our comfy bed at the Royal Sonesta Houston. Some hotels do allow pets, but do not allow you to leave your pets in the room alone. If you are unsure if you can leave your pets unattended, call. It’s not always listed on their website, but I’ve been rudely surprised before upon check-in! While preparing, also consider if your dog needs something to cope with their new surroundings- do they have chewy toys to keep entertained? Would leaving the tv on help? Our Matilda has separation anxiety and our doctor recommended a holistic, chewable pill that helps her deal with her nervous tendencies in high stress situations (also great for other triggers like fireworks). We give her a pill with enough time to digest and a few extra minutes of walking and snuggles before we have to leave, having another dog with her has also had a tremendous impact on her nervous barking and whining. Take time to get to know your dog before you travel, or allow for a plan B if your pup isn’t adjusting well and you need to stay in. Does your dog get nervous around people? Would a new setting that isn’t home freak them out? Do they howl for long periods of time or freak out if they hear someone walk past the front door? If your dog is a little bit more on the high strung side, it may not be a deal breaker, but call ahead and see where your hotel typically places people with dogs- ask if you can be placed on a floor away from high traffic areas and away from stairwells, ice machines or elevators (that ding noise drove our Boston nuts the first time!). While we were at the Royal Sonesta, they placed us at the end of the hallway- and it was very quiet and away from other guests, but this doesn’t always happen! While traveling at another facility a few months prior, we were right next to the ice machine, which meant partiers were walking past our room to refill at odd hours of the night, waking up our dog, and us, in the process! Also- don’t forget a food and water bowl. We have done that before! Brought the kibble, but no bowl (d’oh!) 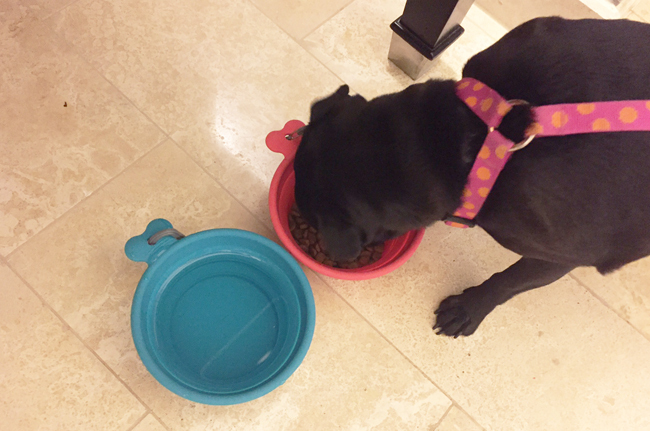 We love these collapsible bowls silicone from Messy Mutt! Please do not assume that any plant or grassy area is open for usage by your pet. Yes, accidents happen and your little bugger can lift a leg faster than lightning on a palm tree by the valet area, but be courteous and be aware. Many hotels now have designated pet areas with complimentary pick-up bags for your convenience (but always bring your own! ), so ask where it is and how to use it. If there isn’t a pet area, or your check-in clerk doesn’t know where it was (which the latter was the case with us at our last stay), keep your dog on a tight leash until he/she is out of the high traffic area and find a quiet place to walk. Your gut will tell you if it’s an OK place to let your dog go- as a hotel guest yourself, would you want a dog unloading by the front doors? Probably not, so walk to a quiet, grassy spot if possible to let your dog relieve itself. The Royal Sonesta was actually the first hotel to let us know that housekeeping wouldn’t be stopping by on their own- which was helpful for us so we knew what to expect and could plan on refreshing the coffee stash and shampoo ourselves with a quick trip to the front desk. At other locations we’ve stayed at, we’ve put the “privacy” placard up for the duration of our stay. Why? Courtesy. (yes, ALWAYS courtesy first when you have pets). I can imagine that a housekeeper entering your room while you’re away at brunch could be very stressful for both the staffer and your pet. Even if your pet is great with strangers in new places, be considerate of the needs of those who are trying to do their jobs and if Fido will get in the way. For shorter stays, it’s never been an issue that we miss a night or two of housekeeping. If housekeeping is a dealbreaker for you, call ahead to make arrangements if possible to take Fido out for a walk when linens are changed. Also- pro tip…TIP. We always leave a few dollars for housekeeping, it’s just nice and chances are your pet, clean as they are, are still a bit messier than the average guest. 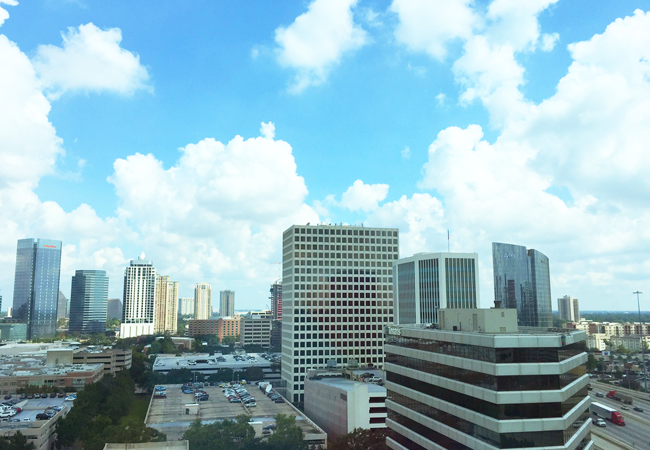 The view from our hotel room in Houston, we loved our stay! Does your hotel allow pets? (if not in their FAQ or policy pages on their website, call). What fees are associated with pets? Are there taxes on those fees? 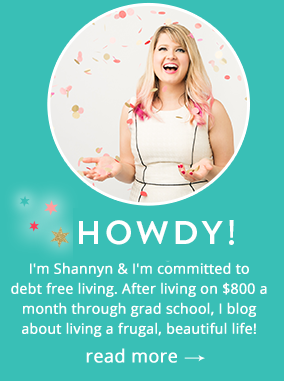 Is it daily or a flat fee? What sized pets are allowed? How does the hotel handle housekeeping when pets are left in-room? Hopefully these tips will be helpful in creating a stress-free and relaxing stay for both you and your pet the next time you travel. Looking for a pet-friendly hotel can be easy, but the nuances to traveling successfully can be what stresses most people out. Plan ahead and be flexible, especially the first few times your travel with your furry family members. One of the easiest ways to ensure you have a great stay is to get on board with the right hotel that fits your needs. 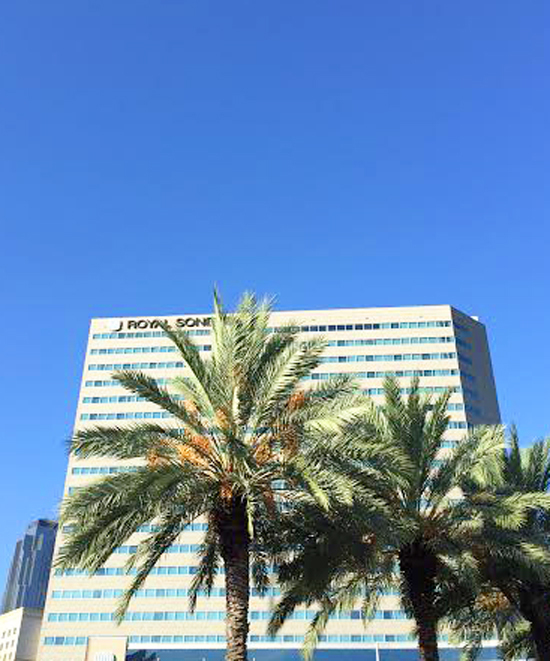 Thanks to Royal Sonesta Houston for helping to facilitate this review during our recent trip to Houston- the facilities were lovely, and you were so welcoming to our furry family members. We loved the long, grassy long walks and how quiet our rooms were! Disclosure: I partnered with Royal Sonesta Houston to facilitate a feature, but was not compensated. Opinions are 100% my own.